The fortunate part about not knowing what lies ahead of you is that sometimes, not knowing makes it possible to muddle through a difficult situation. Sometimes foreknowledge only makes what is coming more difficult to bear. Kat finally found her roll of film from our trip to New Orleans earlier this year. 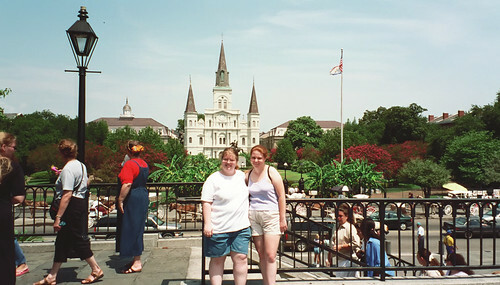 It contains some pictures that I referenced in a previous entry, The Jester of Jackson Square. They’re linked in that entry now, if you’re curious to see photos of the balloon artist (Checkers) I was describing. There are also a few other pictures from that trip which don’t fit in with the theme of that entry. Full photoset here. If you looked closely, one could see the echoes of stubble tracing a faint shadow of pattern-baldness that meandered from ear, to crown, to ear. His eyes didn't always match the laughter in his voice, but when they did, the lines radiated, like spokes, from their corners. When he told stories the words came out razor-sharp. Carnival patois, to match the oversized, indifferently polished black clown shoes he wore. I didn't know how much of his story to believe; after all, he was a balloon artist hustling tourists next to Café du Monde. We left Friday morning, just after six a.m. I awakened, groggy from fitful sleep, and dashed around the house doing errands in a stream of fogged consciousness; as I was putting out the trash for pickup, Kat and Sean arrived. We packed, we left. The second half-hour of a long road trip is always somewhat disappointing. The rush and crush is over; you've left, and there's nothing to get excited about except the mind-numbing expanse of open road. Six and a half hours of highway driving to get to New Orleans.